Francesca Mari, at 17 she began juggling and has since been training through workshops around Europe with numerous international jugglers. She completed her Bachelors in Litterature and Philosophy at the University of Bologna in 2012. Francesca studied clown and physical theatre in Brussels and in Italy with renowned teachers including Micheline Vandepoel, André Casaca, Jos Houben and many others. She works with great passion as a street theatre artist since 2008. 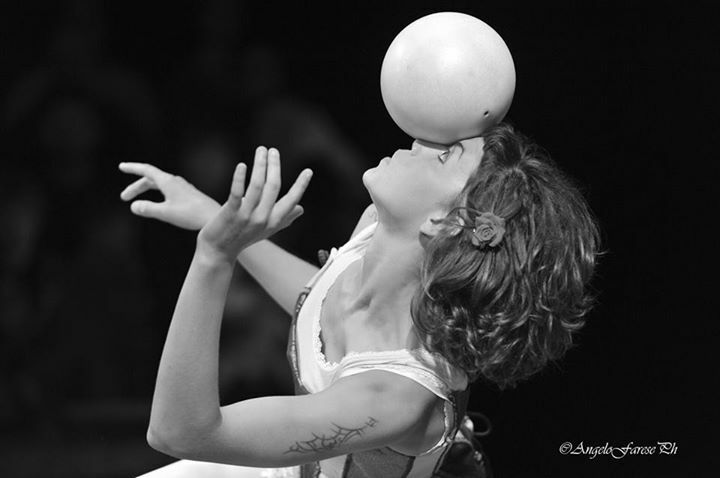 She attended in 2013 FLIC Circus School, in Torino, specializing in foot juggling. In her artistic research she aims to explore influences from dance, acrobatics and theatre, researching a juggling which involves the whole body to transform the ‘traditional’ idea of antipodisme. She worked for CircusMash in Birmingham. Since february 2014 she work whit Gandini Juggling company in the shows Smashed, 8 songs and Meta. In 2016 she perform as juggler and actor in the Opera “Aknathen”, English national Opera, winner of Oliver Award, director Phelim McDermott. From beginning of August till end of October 2017 created and perform in the show “Metropolitan” with GOP Varietè in Hannover. With Christopher Patfield she co-created PaMa’s company.